When I was a kid, my grandparents used to bring us snacks when they came to visit. Although I'm sure they brought a variety of treats over the years, the only brand that sticks out in my mind is Glosettes. 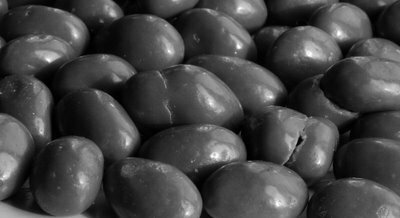 They're chocolate-covered raisins or peanuts, and they are something of a Canadian confection tradition. We don't often have Glosettes in the house, but every time we do, I think back to when I was our kids' age. So when they showed up in the treat bowl a few weeks ago, I tossed them onto the kitchen table and let my lens do the rest. It's funny how a simple kind of food can evoke such powerful memories. Something tells me my grandparents would appreciate that a small gesture would lead to this. Your turn: Do you have a food from childhood that takes you back every time you have it? I hope you'll share your story. Here in the US we call them Raisinettes, Carmi, and they always take me back to my childhood. We always went to the movies on Saturday: double feature, plus newsreel and cartoon. In addition to the always popular popcorn, I always had to have raisinettes. Michele sent me back tonight. Mmm!!! Glossettes rule! I'm partial to the raisin ones myself. When I was young I spent a lot of time at my grandmother's while my parents were at work. She'd make cheese toast for breakfast or and after school snack. Even on the rare occasion I make it for myself, the first bite sends me back to my grandmothers kitchen surrounded by family members dropping in out of the house to say "hi" or just to see what she had cooking. I have to confess, I have never heard of them being called that. We just call them choc coated peanuts, or whatever the filling may be. Jeez, we're boring! Pumpkin muffins... My gran use to bring them to every Xmas Eve. No one else's taste the same. Mine would be Iced Gems, although I don't know if they still exist (just did a quick Google and couldn't find them). An Iced Gem was a tiny round plain biscuit, about 1.5 cm in diameter and 3-4 mm thick, topped with a small rosette of hard icing in a variety of pastel colours or white. My Gran always had some in a tin for me, I didn't know her well as she died when I was only five years old but I know that the taste and texture of Iced Gems would bring her back to me. mmmmm...my favorite CANADIAN confections...Smarties (they had them in Germany but they just were NOT the same), Coffee Crisps, and Flakey cakes. Oh, and I can't forget the pink candy popcorn at the movie theatre. My all time favorite memory food is ribbon candy...my memere ALWAYS had this at her house, even when it wasn't Christmas...and I loved it. The American version of Glossettes, Raisinets, just came out with a DARK CHOCOLATE version, and I am in LOVE. What could be better? Raisins are good for you, dark chocolate is an antioxidant...and they are TOGETHER. My Grandma would make Divinity around Christmas-time. This a a very rich white fudge type of sweetness...I have never had it anywhere but from her. So that definitely takes me back to my childhood. I need to call her up and have her make me some! Did you guys have Wig Wags in Ontario when you were kids? These chocolate-coated caramel twists do not fall into the 'every time I eat one, I remember my childhood' category, but instead into the 'these were quintessential childhood fare, but they don't exist anymore, boo hoo' category. As for childhood memories... every Christmas my grandmother would get my brother and I "LifeSavers". They used to make (and may still) a storybook carton that opened to reveal ten or twelve rolls of the hard candy. There was always a roll of butterscotch and I gave it to Grandpa. I loved the red cherry ones and the multi-fruit ones and a few of the mint rolls as well. Now thinking back, I can't remember the last box I received. Grandma passed away thirteen years ago so it has been probably 15 years, at least. I wonder what candy tradition Nyssa will remember? Maybe Nestle Crunch bars or M'M's? I guess your tastes DO change when you are an adult. When I was a kid, I would have absolutely thought having spinach on pizza would have been blasphemous. Now i find it enjoyable. As ever your macro photos are fantastic! I'm afraid it's streilised cream for me! I used to stay with my Grandparents a lot when I was younger and they used to have sterilised milk and cream which was a hangover from my Grandfathers time in the Army. I hated the milk as it smelt funny adn didn't taste right to me but I loved the cream. Now, whenever I have it I am reminded of my those happy times which is even more poingnant since my beloved grandmother passed away. Divinity. That was mine. My great aunt used to make it every Christmas and send over a pan of it to my house (we lived only a few hundred yards away). Every time I have some, it reminds me being a kid. Those candies are like Raisinettes. I always ate those during the movie matinees growing up. So I would say that is a strong reminder of being a kid. mmmm, mine is sugar daddies..not the little ones they try to peddle now but the big hurkin, take out your back tooth filling, kind. Loved them. The second would be Tootsie Pops. My dad would go to the PX (army speak for grocery store) and would come home with a bouquet of them for me. Seeing them now always makes me see him, standing there in his BDU's, his combat boots, hair slicked back. He was so young and strong. I miss him. Yep, here in the US they are Raisenettes and the peanut ones are "Goobers". I was lucky, I had 4 sets of Grandparents and 2 spares being the oldest child of the oldest children. All kinds of goodies came my way and I can't really put a finger on a favorite. Except, maybe ice cream. Grandmom always had ice cream and I asked my Mom why we didn't. Mom said, "When you get older and have children you'll realize why there is no money left for ice cream." Well, heck - I sworn then and to this day there has always been ice cream in my freezer. My fondest confectionary memory isn't from childhood; rather, it is from a time when we were all younger at heart. It must have been at least 10 years ago now. A group of us--three couples to be exact--had gotten together for a monthly games night. Everyone brought appetizers and assorted treats. On this particular occasion, someone brought Bridge Mix. For those who don't know (or don't recall), Bridge Mix contains a variety of 'bits'--peanuts, raisins, jellies, mints, etc.--covered in light or dark chocolate. If you're familiar with the various shapes, you can predict what you're getting; otherwise, each morsel is a surprise. During a lull in the conversation, one of the girls, bit into a mystery piece. She promptly made a nasty face, then handed the half-eaten candy to one of the guys saying, "Eewww!!! I don't like this. Here, Paul, you eat it." Thing is, Paul was not her husband/partner. To this day, we give Paul any food we don't like or don't want... and we still tease her about this! My twin sister and I each had a favourite treat. She chose the Aero bar and I chose Glosette Raisins. They made their way to our stockings without fail. I do periodically treat myself to a box and I smile at the delicious wisdom of childhood. Kids' candy - leaded or unleaded?